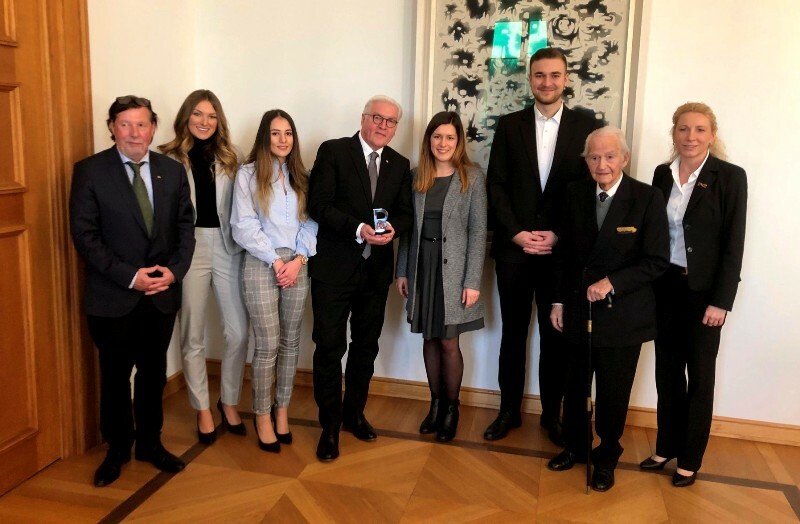 Wolfsburg/Berlin – At the invitation of the International Auschwitz Committee (IAC), four apprentices from Volkswagen yesterday accompanied Leon Schwarzbaum, a Jewish survivor of Auschwitz extermination camp, to a reception given by German President Frank- Walter Steinmeier. The 98-year-old from Berlin honored the German head of state with the “B” statuette. With this statuette, Auschwitz survivors and the IAC honor women and men who stand up for democracy, tolerance and human dignity and keep remembrance of Auschwitz alive. 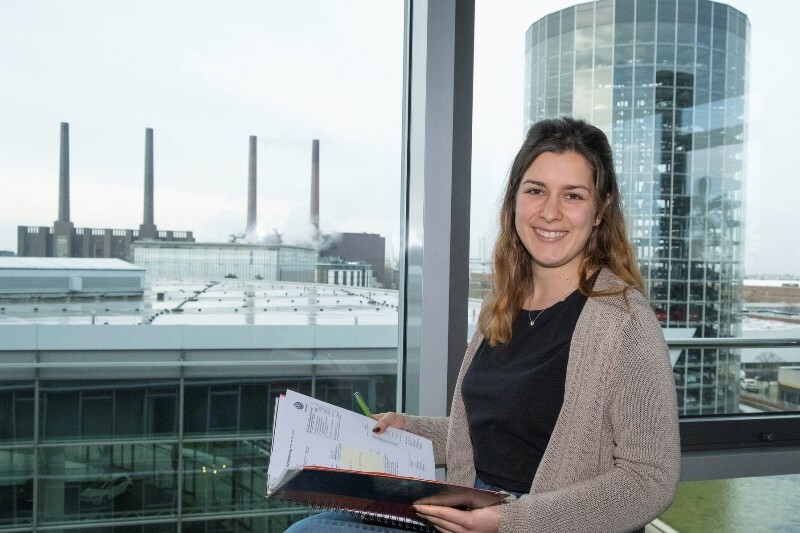 Last year, the budding Volkswagen specialists had helped to maintain and preserve the Memorial Site at Auschwitz Concentration Camp. The Presidents’ guests were apprentices Josefine Degen (21, specialist in office management) and Eloisa Marzell (23, industrial clerk), both from Wolfsburg, Evdokia Siori (19, warehouse logistics operator) from Volkswagen Commercial Vehicles in Hanover, and Denis Wieckowski (22, electronics technician for automation) from the Brunswick plant. The sculpture was inspired by the letter “B” in the cynical inscription “Arbeit macht frei” (work will set you free) above the main gate of the former Auschwitz Concentration Camp. During the welding of the inscription, camp inmates had, secretly and unnoticed by the guards, turned the letter “B” upside-down as a mute sign of their resilience and their courage towards the SS. The first draft of the “B” statuette was produced by Lutz Brandt and the sculpture was designed by Michèle Déodat. 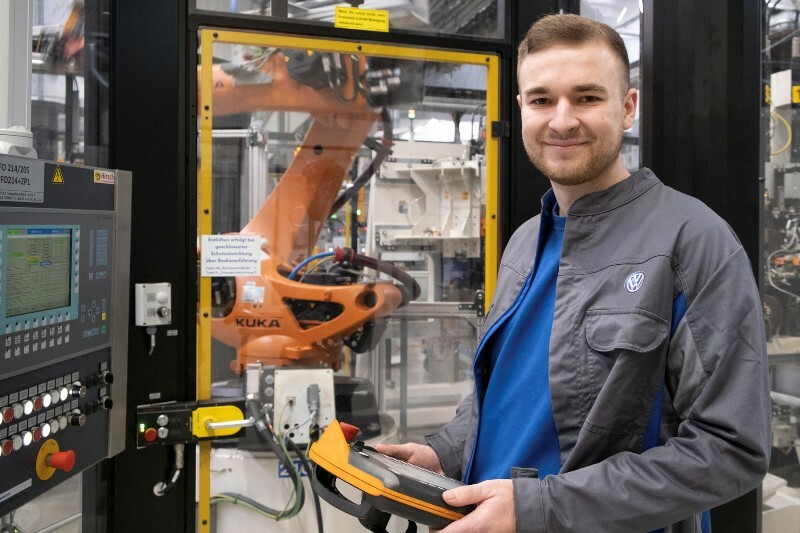 The 12- centimetre-high statuette was hand-crafted by apprentices of Volkswagen Commercial Vehicles in Hanover. The figures from politics, business and society who have been honored by the award of the statuette included Pope Francis, Prince Charles, the heir to the British throne, Ban Ki-moon, former UN Secretary General, Shimon Peres, the late former President of Israel, and German Chancellor Angela Merkel, as well as Sigmar Gabriel, former Vice- Chancellor and Chairman of the SPD.